is having a sale! It starts 1/16 at midnight and will last until 1/18 at midnight. (I'm not sure whose midnight … you might want to shop early, just in case.) Receive 20% off your order, and you can combine this sale with the free shipping offer (but no other offers). When you order, mention "3 Day Sale" in the message box. You can either wait for a revised invoice or, if you want to pay immediately through Paypal, Sandra will refund the difference. It is so freakin' cold here in Chicago right now that I can't even imagine when it would be possible to wear this dress, but I know lots of you are in warm places … Remind me what that feels like? You can tell me after I put on this third pair of socks. Lisa sent me the link to this eBay auction, ending Saturday. Go ahead and click through, you really owe it to yourself to look at this dress. It's listed by (Their motto: Vintage for Your Inner Delinquent) and, at time of this writing, was at a Buy It Now price of $175 … Bust 38. Forget and , I am now feeling a distinct lack of bongo-themed clothing in my life. I am also saddened to realize that my inner delinquent is pretty much my outer delinquent, except my inner delinquent 1) remembers to PUT ON the red lipstick she bought and 2) never gets it on her teeth. I don't usually make new year's resolutions — I mostly just try AGAIN to do all the things I really, really meant to do in the previous year — but if I were to make a resolution for 2009, it might be NOT to buy new fabric until I've made a dent in the fabric I already have. I swear, folks named Rita are really good luck for me lately. 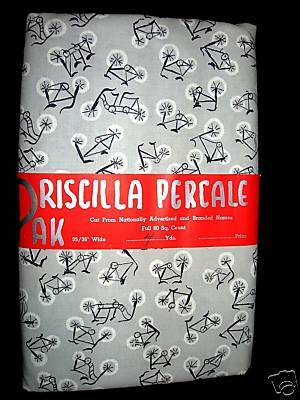 Rita C. emailed me out of the blue and said "Not positive you would be interested in this bicycle fabric …" Bicycle fabric! I don't think I finished the sentence before I clicked the link. 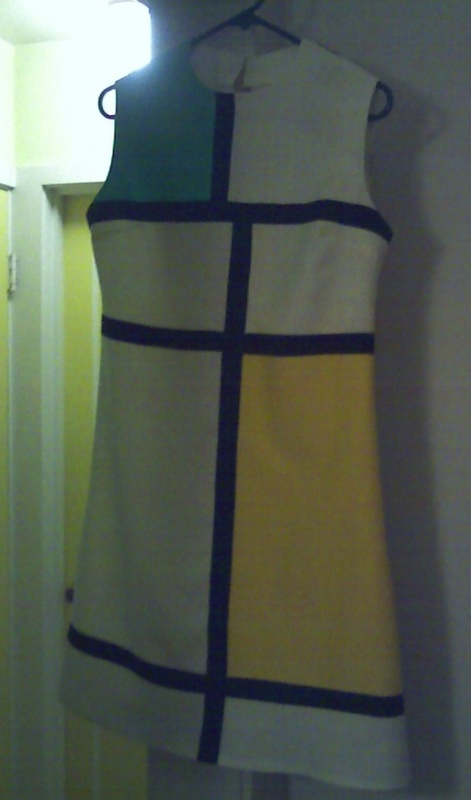 I can't remember the last time I browsed fabric on eBay, so there's no way I would have seen this fabric without Rita's kind offices. It was from seller , although she doesn't have too much other fabric listed right now. I love that this was marketed as a time-saver — don't wait for your fabric to be cut, just grab a "pak" and go! This is the fabric equivalent of bagged lettuce (which I love, btw)! I wonder if it was sold at stores that didn't otherwise have a fabric department, like the crappy thread they sell in the grocery store — or used to, I haven't seen a notions section in a grocery store for ages. What will this turn into? 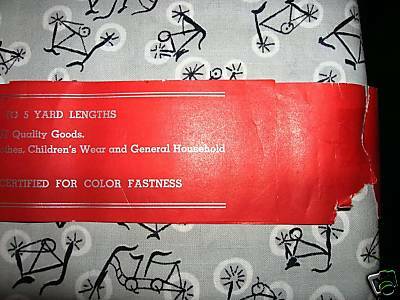 Well, it's 4 yards at 35 inches wide, so probably a narrow shirtdress of some kind. When I know, you'll know! I must be getting old, because this pattern from the 1980s is engendering a kind of gauzy nostalgia (instead of nausea) in me. Granted, in the 1980s I wasn't really in a Dynasty-era power-dressing place (I was in jr. high, which requires power dressing of a different kind), but I don't think I expected to like this dress (at ) as much as I do. Wouldn't this be nice in gray flannel, with a choker of gobstopper-sized cloisonné beads?